Every year, $15 billion is spent on commercial roofing in the United States alone. NIR Roof Care is there 24/7/365 for Commercial Roof Emergency or Commercial Roof Repair, Nationwide. Do you have a Commerical Roof Leak over costly equipment or in an area with heavy customer traffic? 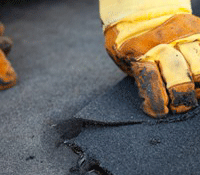 Are you experiencing a Flat Roof Leak Emergency? Have you had your roof "repaired" only to have it leak again at the next rainfall? If you have an emergency, call us right now at 800-221-ROOF (7663) and we'll have a Certified Roof Care Specialist® there today! Getting your commercial roof repaired or having a flat roof leak emergency taken care of quickly will mean less company downtime, less disaster restoration and let's face it - Money Saved! There's a reason NIR has been in the commercial flat roofing business for more than 37 years and has an A+ rating! From the article: 17 Roofing Industry Statistics and Trends published, May 25th, 2017: "The roofing industry has been listed among the top 10 industries that receive the most BBB complaints... The most popular documented reasons were: Unsatisfactory workmanship, delay or failure to start or finish work, delay or failure to make repairs, poor customer service and missed appointments. We’ve found that there is lots of resentment towards the roofing company because of "gypsy roofers" who promise them everything after a bad storm comes through and then vanish once done leaving companies with poor workmanship and no way to correct it with the "warranty" they were given. We've found companies who don't want to have services done because the last roofer they had come "fix" their roof, came out multiple times and they are still leaking! We've had one customer tell us they had a small clogged drain that needed to be resealed and was told by a roofer that he needed a whole new roof! For an emergency - call us now at 800-221-ROOF (7663). Let the industry experts in commercial roof repair and care take care of your building today!